Post Office Department and the Patent Office. Financier Samuel Blodget convinced the DC commissioners that money could be raised to support public buildings by means of a lottery. 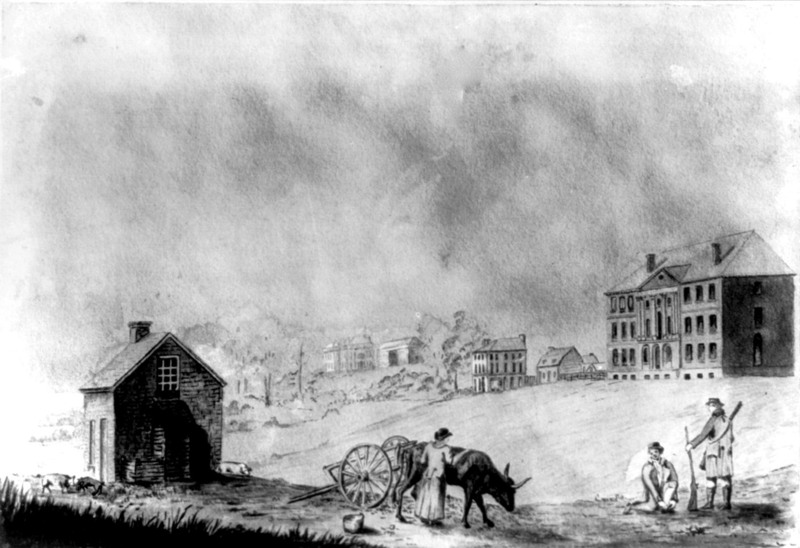 Blodget had White House architect James Hoban design and build the Grand Union Public Hotel in 1793 as the $50,000 grand prize in his lottery. This landmark would have been one of the first hotels in the United States (hitherto, travelers had stayed in taverns or inns), but it was never actually used as a hotel. After much tribulation, the lottery failed when the winner discovered that the hotel he had won was not yet finished. He sued both Blodget and the Commissioners. 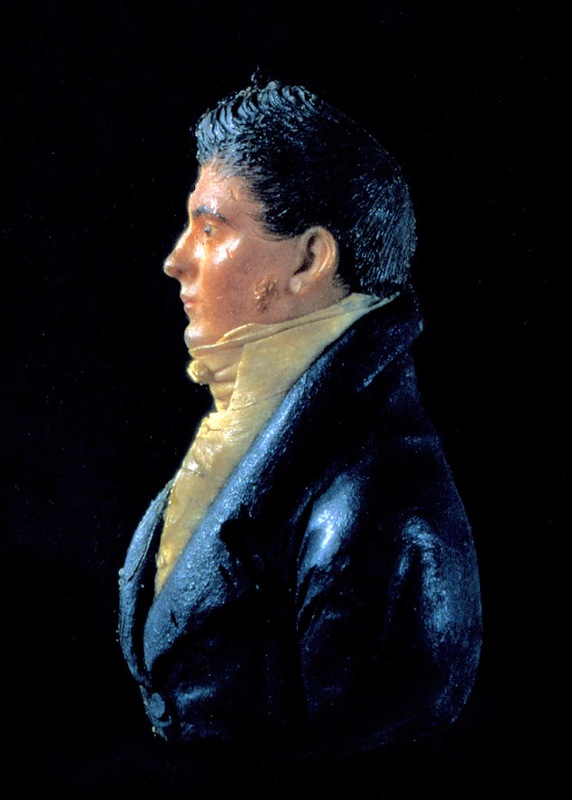 Blodget went bankrupt, landed in debtor's prison, and died in a Baltimore hospital in April of 1814. 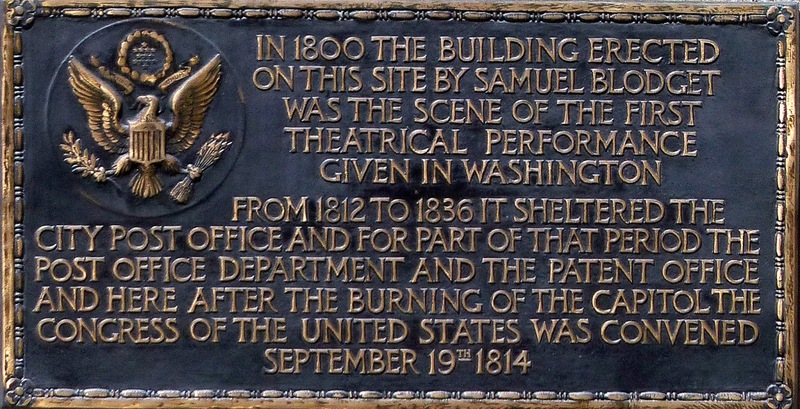 In 1800, the United States Theatre was founded in Blodget's Hotel. Thomas Bogar describes the situation this way. 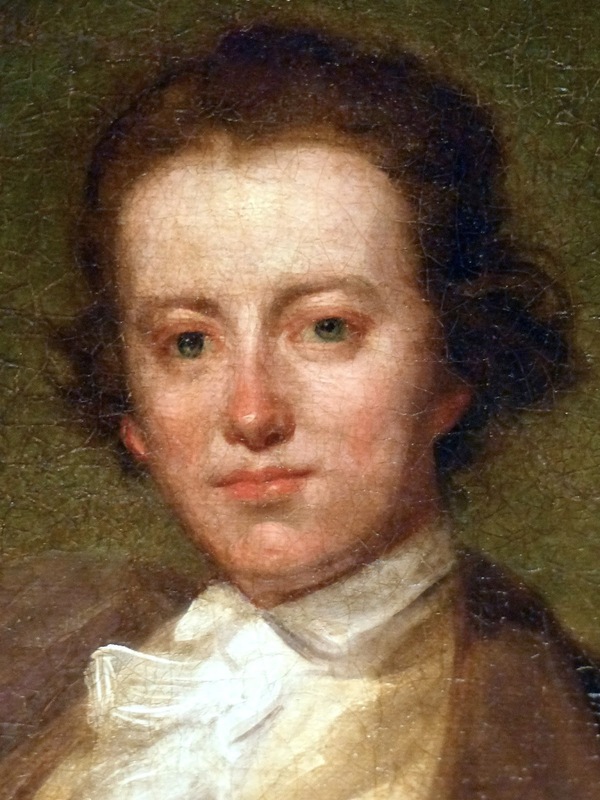 [Philadelphia actors John Bernard and John Darly] returned in August 1800 to open the United States Theatre, Washington's first professional theater, in the half-finished red-brick Blodget's Hotel (also known as the Grand Lottery Hotel, built to be first prize in an abortive moneymaking scheme). Filling the north side of E Street between 7th and 8th Streets, it consisted of a spacious central building containing a 40' by 60' assembly room where the company performed - and sizable wings. Still, it was a crude venue. Despite its impressive four-story Federal facade, its incomplete roof allowed rain to intrude, its floor consisted of rough-hewn boards with significant gaps, and its seats were backless benches cobbled together from the remnants of floorboards. 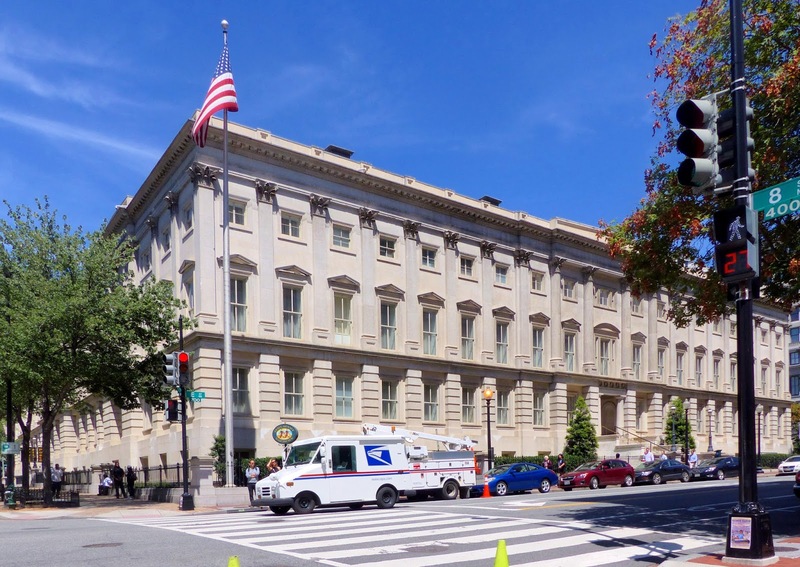 The U.S. Government took over and finished the abandoned building in 1810, using it to house the Post Office and the Patent Office among other offices. 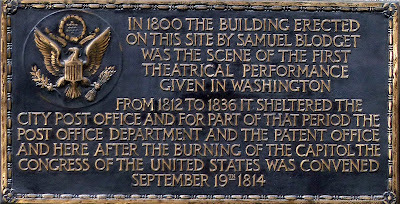 On the morning of August 25, 1814, during the War of 1812, British troops under General Ross were burning the public buildings of Washington. William Thornton, designer of the Capitol, who had been the Superintendent of the Patent Office since 1802, had already removed all the patent documents from the old hotel building but could not remove all the patent models. When Thornton heard that a detachment of troops led by Col. Timothy Jones was preparing to burn Blodget's hotel, he, along with Charles Carrol, Esq., hurried to the hotel. Thornton was hoping to retrieve the model of a musical instrument he had invented and that he remarked "had cost me great labor." After Jones' men finished burning down the National Intelligencer newspaper, Thornton managed to convince Jones that, although the old hotel building was indeed federal property, the patent models inside were private property, declaring that "to burn what would be useful to all mankind would be as barbarous as to burn the Alexandria Library, for which the Turks have been condemned by all enlightened nations." Jones relented and let the building stand. 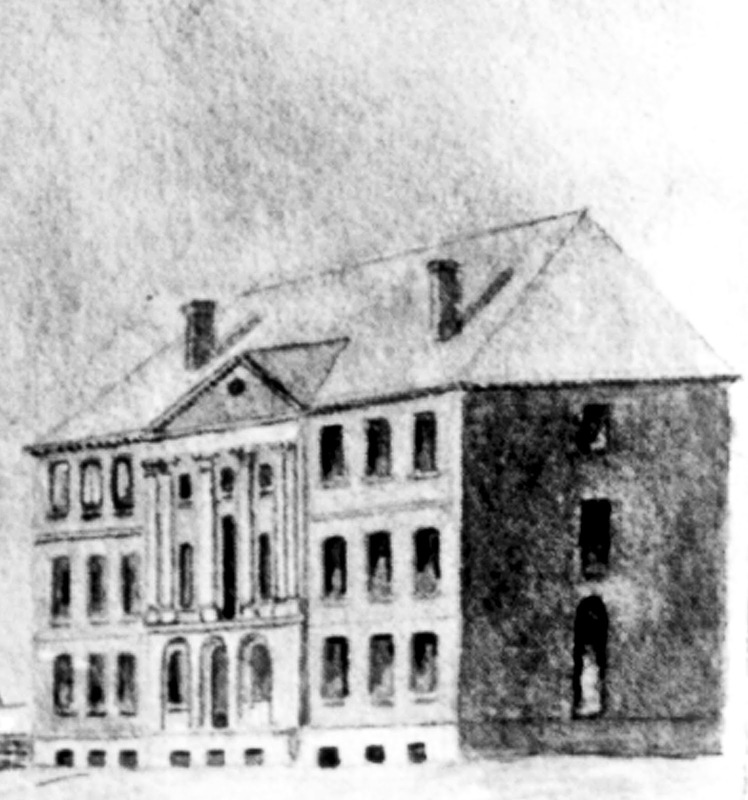 The Capitol building having been burnt, the 13th Congress met in Blodget's Hotel on September 19th, 1814. Debate broke out over whether to move the U.S. Government out of now ruined Washington. Before they adjourned on March 1815, Congress authorized Madison to borrow money to rebuild official Washington. In December, they moved into the "Old Brick Capitol" on the site now occupied by the Supreme Court where they remained until they moved back into the Capitol in March 1819. 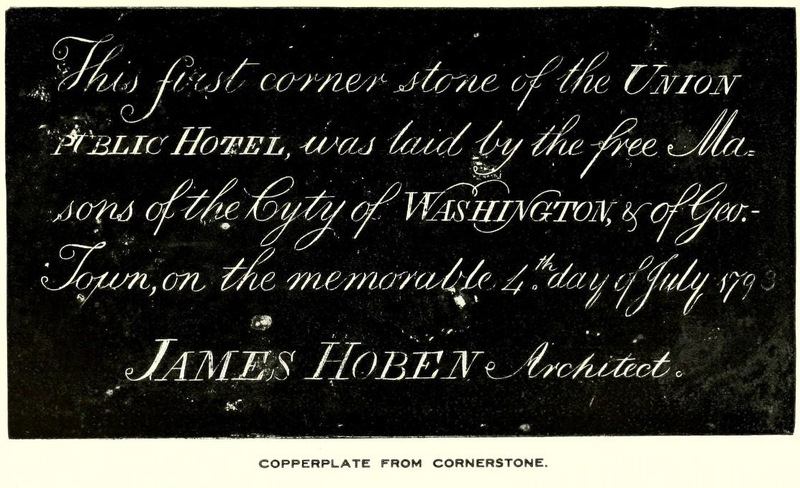 This first corner stone of the Union Public Hotel, was laid by the free Masons of the Cyty of Washington & of Geo. 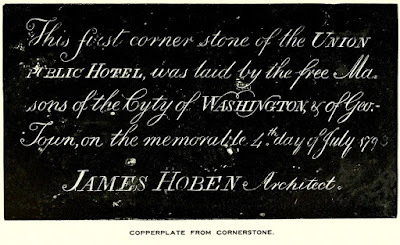 Town, on the memorable 4th day of July 1793, James Hoben Architect. 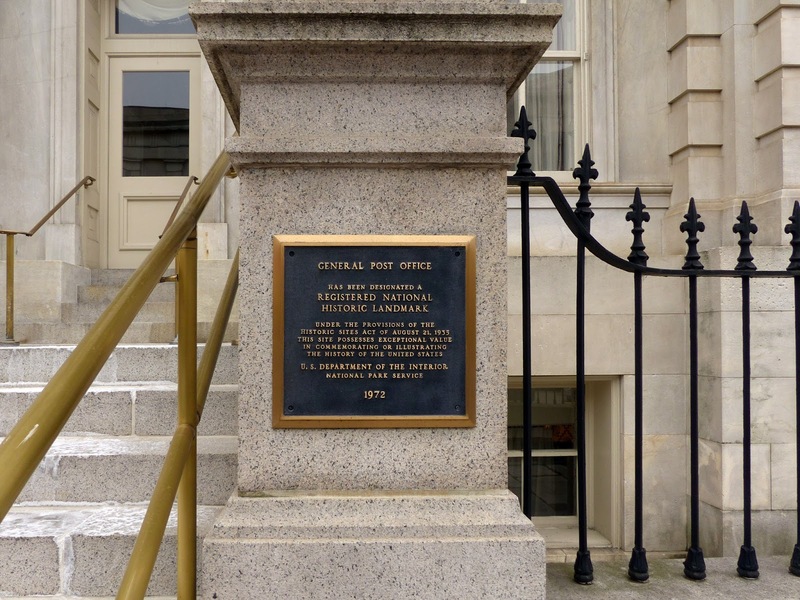 The Patent Office moved into a new building at what is now Gallery Place, and the Post Office built a new fireproof building on the site designed by Robert Mills, which came to be known as the General Post Office building. 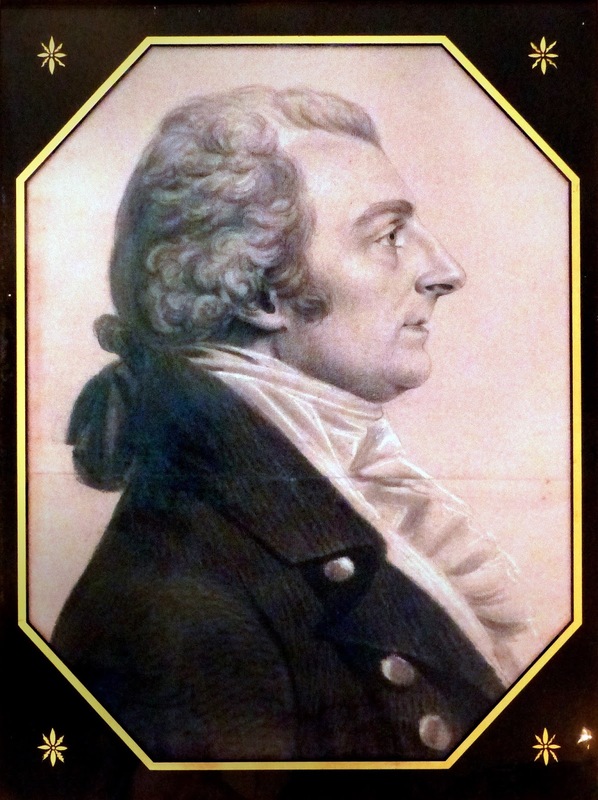 Mills also designed the U.S. Treasury building, the Patent Office building, and the Washington Monument. 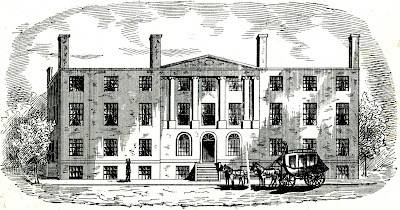 The General Post Office was constructed between 1839 and 1866 in two stages. 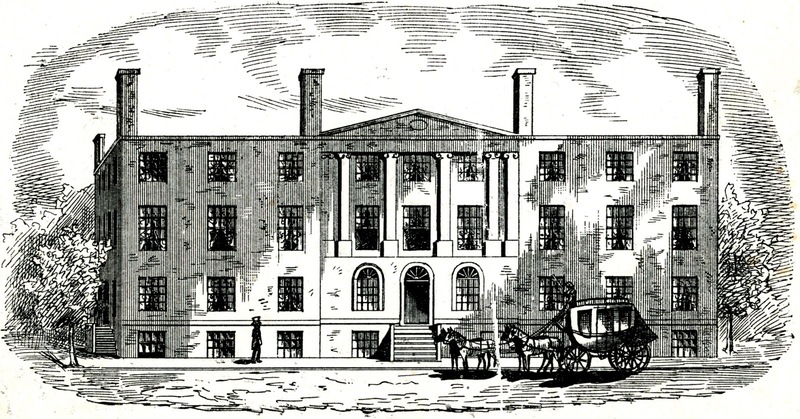 Charles Dickens described the southern part of the building completed in 1842 as "a very compact and very beautiful building." 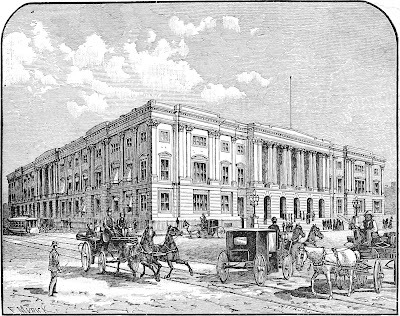 Harper's Magazine remarked in 1859 that "We doubt if there is a building in the world more chaste and architecturally perfect than the General Post Office as now completed." Architect Thomas U. Walter oversaw the 1855 northern expansion. Construction had to be halted during the Civil War, so the building was not completed until 1866. A Union supply depot occupied the basement during the war. 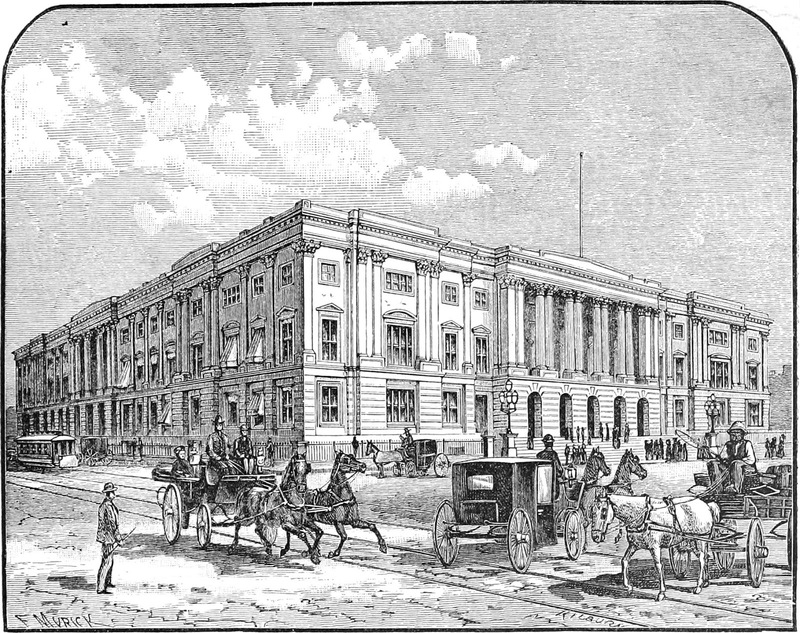 This illustration "The General Post Office" appeared in Picturesque Washington by Joseph West Moore in 1884. 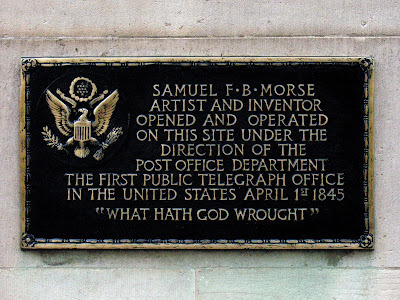 On April 1, 1845, a small two-story house on 7th Street, soon to be swallowed up by the Post Office Building, housed the first telegraph office in the United States. 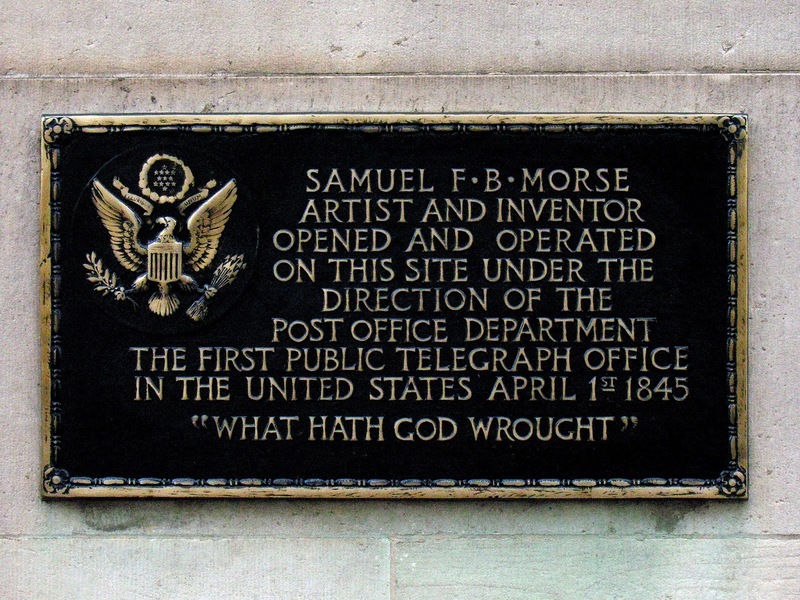 It should be noted that the message "What Hath God Wrought" was sent not from this site but from the Capitol, in 1844. 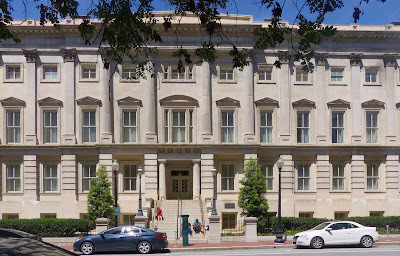 The General Post Office building has housed many government entities, including the Land Office, the Tariff Commission, and the International Trade Commission. 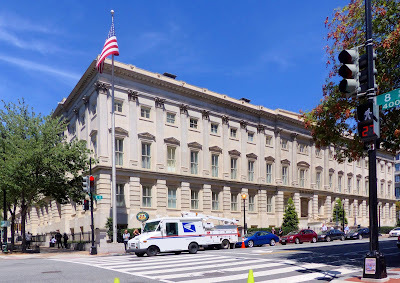 After WWI, it housed General Pershing's headquarters.The Post Office moved in 1897 to a building now called the Old Post Office, soon to be the Trump International Hotel. 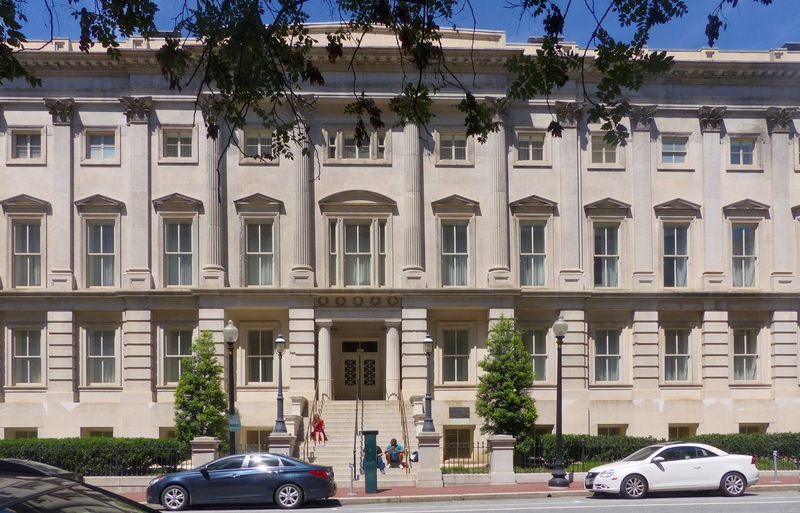 The ITC moved out of the General Post Office building in 1988, and Congress gave the run-down building to the Smithsonian, but the building sat empty for a decade, allegedly used as a crack house. The GSA ran a competition for renters of the property which Kimpton Hotel and Restaurant Group won. 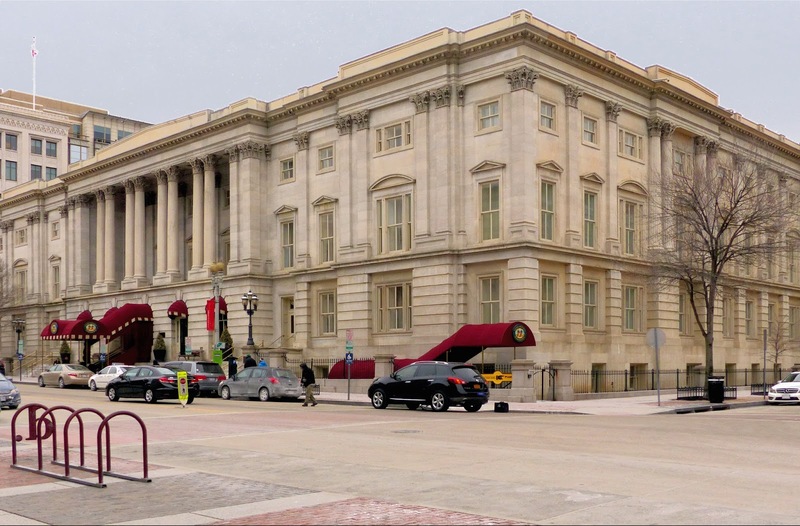 The Hotel Monaco opened in the old General Post Office building in 2002 with a 60 year lease. Interesting stuff. Thanks for pulling this all together!